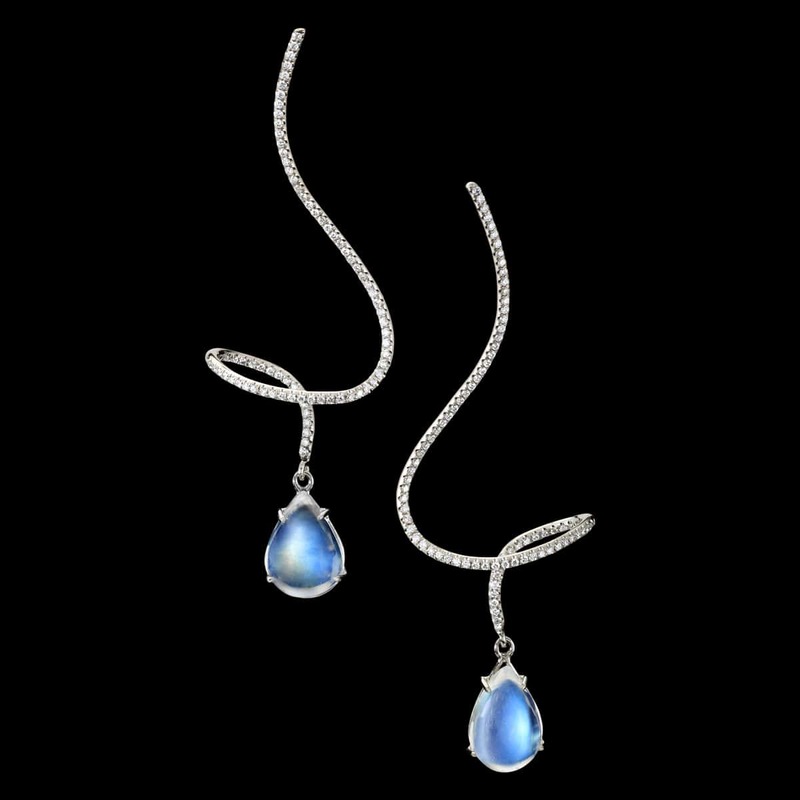 Moonstone achieves a magical effect called adularescence when the stones’ layers reflect and scatter light. The color is usually white but occasionally blue with an appearance like rolling fog or smoke. For this unusual and spectacular light effect, this adularescent jewel is one of a class of gemstones called phenomenal gemstones, deemed so for displaying some special light interaction or “phenomena”. These dazzling light effects, occurring as a result of internal crystal structures, have captivated onlookers through the ages. 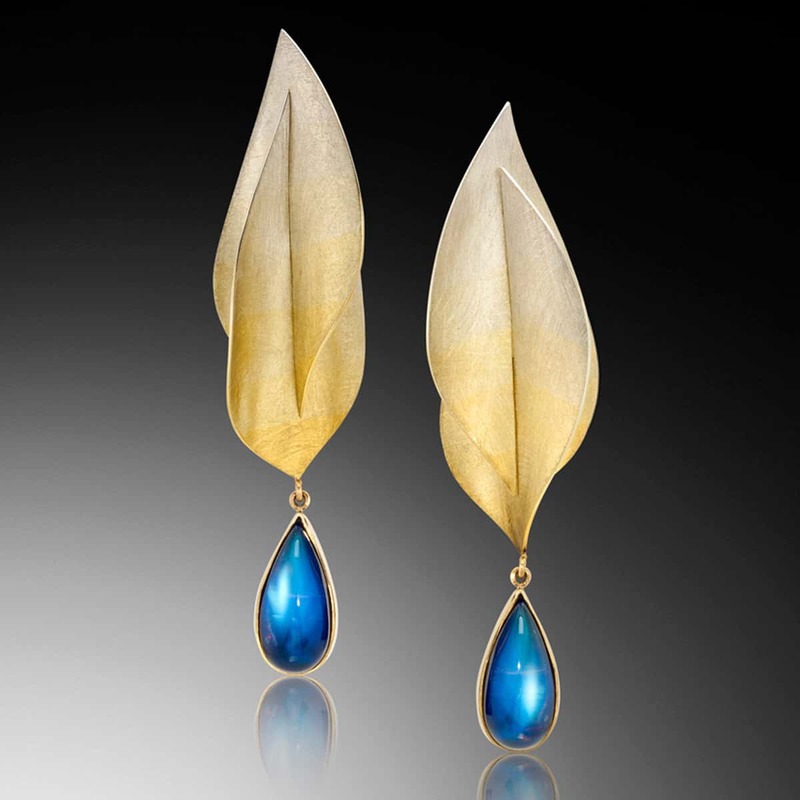 The earrings pictured above, entitled Spectra, feature two dazzling rainbow moonstones in a gradient gold setting. Adam was the recipient of 2 MJSA Vision Awards for these beauties. Read more in our awards feature. Pictured right are Moonstone Pirouette Earrings and Killer Moonstone Cufflinks, featuring opulent Cat’s Eye Moonstones. 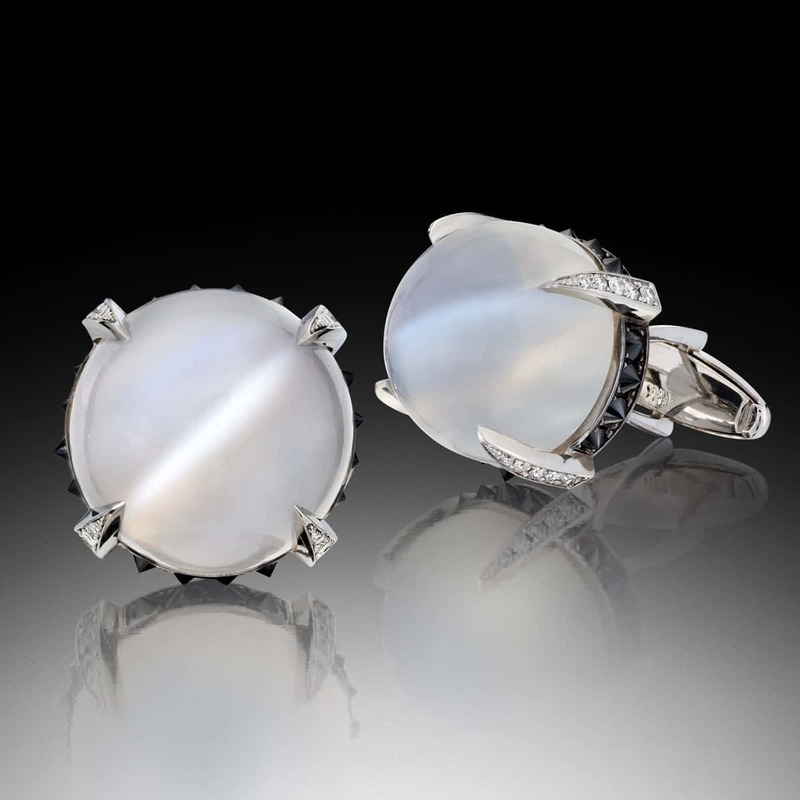 During the Art Nouveau period, moonstone’s popularity soared. It was featured prominently in jewely created by René Lalique. In many cultures, it is regarded as a sacred and magical stone. For example, in India, it is believed to bring sweet dreams and good fortune. Learn more at GIA’s website. Are you a moonstone lover? We’d be happy to keep you updated on Adam’s newest moonstone creations as they’re completed or discuss custom work to realize the jewelry of your dreams. Reach out via our inquiry form and we’ll follow up with more information.